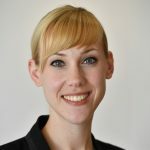 Home » Blog » General » The new DfE teacher recruitment and retention strategy – what’s the plan? The new DfE teacher recruitment and retention strategy – what’s the plan? The Department for Education has this morning published its new and eagerly anticipated teacher recruitment and retention strategy. This is the first of our two blogs exploring the strategy. This one summarises the strategy, whilst the second by our Chief Exec, Loic Menzies provides a critique and response. Education Secretary Damian Hinds first announced the government was looking into the issue nearly a year ago and since then, the DfE as developed the strategy in collaboration with teachers and other education professionals. It aims to ensure careers in teaching are “attractive, sustainable and rewarding”, and stem the steady stream of qualified teachers who are leaving the classroom for other work. The new strategy is a response to the fact that England is not recruiting enough teachers to meet demand, or keeping enough of those who do join. For every 28,000 new teachers coming into schools, there are 43,000 walking out of the door. 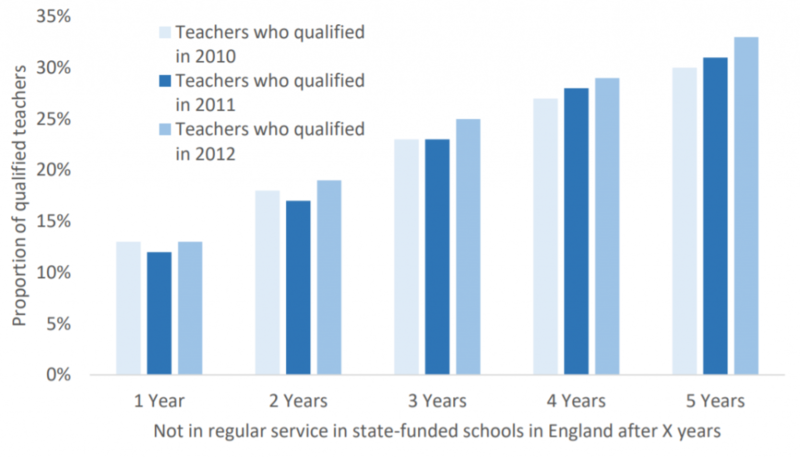 Around 20% of teachers leave two years after they qualify, and 33% leave five years in, as the graph below shows. There are particular problems with attracting subject specialists in some areas too, and this is more acute in areas of disadvantage. More than one in ten teachers from the most disadvantaged secondary schools leave to teach elsewhere: around twice the proportion who make the same move from the least disadvantaged schools. How will the new strategy turn these problems around? The new strategy promises to “radically simplify” the current accountability system for schools, through two main proposals. The first is to make the Ofsted ‘requires improvement’ grade the only trigger for formal intervention (such as forced academisation), thereby replacing floor and coasting standards altogether. Secondly, the new Ofsted framework, which comes into force in September, will actively focus on reducing workload. Ofsted inspectors will consider staff workload as part of their assessment of leadership and management, but will not look at data tracking systems, specific evidence of lesson-planning and marking, or pupil targets and predictions. Overall, the watchdog will look unfavourably on schools that are seen to have “burdensome” data practices. To provide better support for early career teachers, the DfE has announced the introduction of a new ‘Early Career Framework’. This will be a two-year package of structured support and mentoring for new teachers, covering five key areas of development: behaviour management, pedagogy, curriculum, assessment, and professional behaviours. In each area, the framework specifies the things a teachers will “learn that” and the things teachers will learn “how to”. As part of the ECF new teachers will be guaranteed 5% off-timetable time in their second year of teaching. The DfE will fully fund a national roll-out of the ECF in September 2021, and expects to invest “at least an additional £130 million every year” to support its delivery in full. The roll out will include free curricula and training materials for schools. Phased bursaries, which have already been introduced for maths teachers, will now be introduced for other subjects too. Maths recruits currently receive £20,000 tax-free in their training year, with additional £5,000 tax-free payments in both their third and fifth years of teaching – instead of just getting an up-front bursary of £26,000. These staggered retention payments are hoped to encourage good practitioners to commit to the profession longer term. For teachers who have been in the job longer the DfE will create new specialist qualifications that offer non-leadership career pathways, allowing thos who are interested to “stay and excel in the classroom”. They will focus on topics like assessment, behaviour management, subject and curriculum expertise, and pedagogy. Alongside the roll out of the ECF reforms, the first of these specialist qualifications to be created will be a ‘Teacher Developer NPQ’. The DfE has also pledged to focus its investment (in both the new and existing leadership qualifications) “disproportionately in challenging schools”, with the aim of encouraging good teachers to take up work where they are most needed. The strategy has promised to help headteachers transform approaches to flexible working in schools after school workforce data from 2017 showed that teachers leaving the profession were often moving to flexible or part-time work. Only 28% of female teachers work part-time, compared to an average of 40% of women in the UK, and fewer men do too – 8% compared to 12% in the whole economy. The government plans to make teaching more flexible by creating a new “find your jobshare” website that will support teachers who are looking for jobshare partners. It will also launch a competition for EdTech providers to create solutions that promote and facilitate part-time and flexible working patterns, such as time-tabling tools. The DfE is planning a comprehensive review of the pay framework to support more flexible career pathways for teachers too, and will be asking the School Teachers’ Review Body for recommendations on how to achieve this, with a view to implementing reforms in 2020. Finally, the strategy proposes to streamline the ways that people can get into teaching, by introducing new digital systems that will make the application process more user-friendly. The DfE will launch a new “one-stop application system” which will collate all the available initial teacher training opportunities and information about training providers in one place for prospective teachers. It will also launch a ‘Discover Teaching initiative’ to attract a wider range of individuals into teaching. This will offer more opportunities for people to experience teaching and see if it might be right for them, including virtual reality classrooms, more teaching internship opportunities, and more school ‘taster days’. Teachers are Humans: What does that mean for school leaders trying to recruit and retain them?